Elvis Costello caught a recent episode of Jimmy Fallon's "Tonight Show" and heard something he liked. Miley Cyrus was the night's guest, and she covered a cover with the help of The Roots. Odetta's 1965 take on Bob Dylan's "Baby, I'm in the Mood for You" is quite a departure from Cyrus' latest psychedelic collaboration with the Flaming Lips, but made the song her own. I spoke with Costello on the phone Wednesday to preview his Oct. 10 concert stop in OKC, and he heard the influence of Oklahoma-born rockabilly pioneer Wanda Jackson. "She sounded just like Wanda," Costello said. "I mean that as the highest compliment. I was super impressed by the way she sang. Because I don’t listen much to that kind of music usually, and she come out and just played with The Roots doing this kind of like 1962 Bob Dylan song. It’s a folk/blues song and she just killed it and she sounded just like Wanda. There wouldn’t be any higher praise." "You can see it on the cyber, I believe," he added with a laugh. My full interview with Costello will run Oct. 7 in The Oklahoman. Check out the excellent performance below. The death of country music legend Merle Haggard left an impression on Elvis Costello, the prolific London-born Rock and Roll Hall of Fame musician and singer-songwriter behind classic late-’70s new wave and punk rock releases My Aim Is True and This Year’s Model. It is not unusual that Costello would encounter another famous musician. Costello is a self-proclaimed serial collaborator. Of his more than two dozen career studio albums, six were made with other bands or artists. He has produced for Paul McCartney, The Pogues, The Specials and Nick Lowe (his own longtime producer). For an Englishman, the musician is also incredibly well versed in classic American country music. Costello released Almost Blue, a collection of classic country covers, in 1981. The album includes a version of “Tonight the Bottle Let Me Down” by Haggard, the Okie from Muskogee and Oklahoma Music Hall of Famer (technically California-born) who died in April on his 79th birthday from complications of pneumonia. During a recent Oklahoma Gazette phone interview, Costello reminisced about meeting Haggard. Costello’s acclaimed Detour tour makes a Monday stop at Chevy Bricktown Events Center, 429 E. California Ave.
Costello told The New York Times in an October 2015 Q&A that while growing up in England, hearing music by artists like Haggard and George Jones was one of the first times the country genre really clicked in his mind. Haggard was long known for earnest storytelling and an authentic outlaw aesthetic Costello could see when the two met at a show in 2009. The musician was attending a surprise salute to iconic country songwriter Hank Cochran in Nashville. Costello remembers being in a room with other legends like Cowboy Jack Clement and Bobby Bare before the show when he came across Haggard. Costello, unlike some other A-list entertainers in the industry, is a genuine audiophile and music nerd, even at age 62. Though he counts Haggard as one of his biggest country influences, he said he still sometimes discovers songs in the artist’s back catalogue that blow him away. In addition to “The Bottle Let Me Down,” Costello occasionally performed “I Threw Away the Rose” at gigs. He remembers his impromptu decision to do the song at a Detour show in San Diego, a four-hour drive from Haggard’s hometown in Bakersfield, California, the night Haggard died. In recent years, Costello has frequently performed alongside Atlanta roots-rock sister duo Larkin Poe, which is scheduled to open for and back him during his Oklahoma City concert. Costello said they were onstage with him when he launched into his unannounced tribute. Fans who see Costello in Oklahoma City will see the musician perform in front of a giant screen featuring projected pictures of Costello’s family and personal photos mixed in with other images the artist deems appropriate for this show. No two Detour shows are identical, he said. Costello said the stripped-down, intimate shows help him find greater personal meaning in crowd favorites he has played thousands of times before. Instead of going through the motions, partially hidden behind a wall of sound, Costello incorporates the audience’s energy to complete the show’s equation. Elvis Costello wants his concert to be a living thing. The English singer- songwriter, 62, will bring his “Detour” concert to Oklahoma for a second time Monday night. Along with it comes a continuing Costello family tradition of performing live that stretches back to his musical grandfather, a huge stage prop shaped like an old-school TV set and stripped-down interpretations of iconic material spanning Costello's 40-year career. The Rock and Roll Hall of Famer's retrospective solo tour overlapped with his recently released memoir “Unfaithful Music & Disappearing Ink.” You might hear some of the same stories, but there's a big difference between the two. When writing, Costello searched inward. Onstage, he's reaching outward to connect with an audience. The “Detour” set is rooted in the past, but Costello said he doesn't aim to be nostalgic. His stage helps. Any image can get thrown on Costello's TV backdrop. He uses this to again connect with his audience and to share musical mementos he's discovered while touring. It also keeps Costello from missing home. Maybe Oklahoma-born jazz trumpeter Chet Baker will get a shout out Monday. Costello met Baker during a short-notice '80s recording session in London, which led to the recording of the song “Shipbuilding” and opened up Baker to a new audience. Costello remembered sitting down with the Okie for an interview. “He had some hard times, he had some serious problems with addiction, and at different times it took him way down,” Costello said. 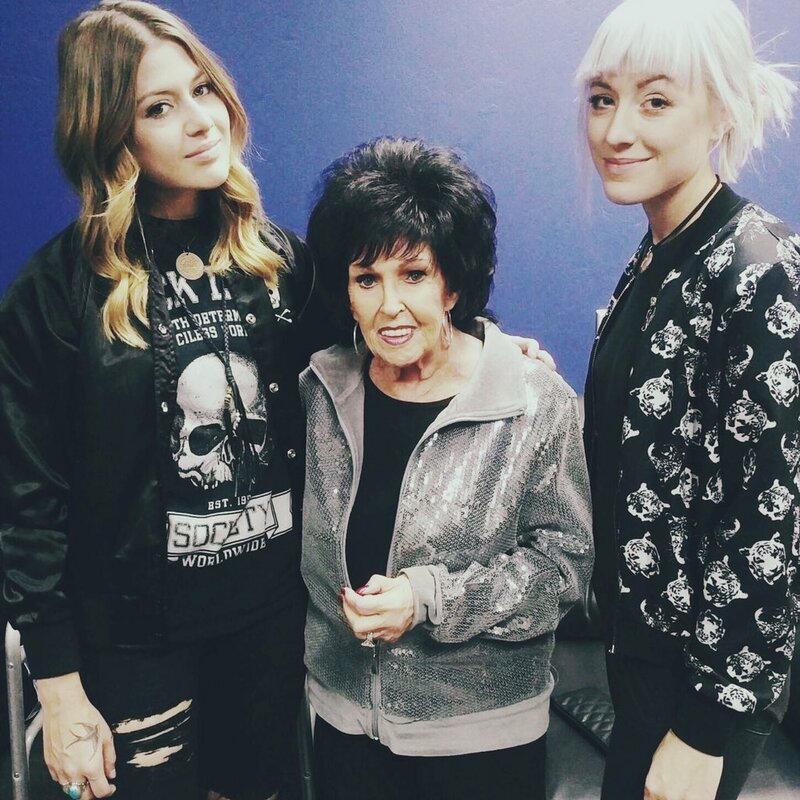 Or maybe Oklahoma City-based rockabilly queen Wanda Jackson might be a fit for Costello's big screen. A different festival set connected Costello with his “Detour” opening act, Larkin Poe. Rebecca Lovell and Megan Lovell front the roots rock act and met Costello at MerleFest several years ago. The North Carolina festival honors Doc and Merle Watson. Costello said the Atlanta- based sisters stole the show, and he hasn't stopped inviting them onstage since. Costello is also mixing in songs from an upcoming musical re-imagining of the 1957 film “A Face in the Crowd.” The movie starred Andy Griffith, Patricia Neal and Walter Matthau. Playwright Sarah Ruhl is teaming up with Costello on the adaptation. I haven't been here since the remodel. Looks awesome inside and the sound is great. The biggest suckiest part is getting in the damn place. The have one line for general admission and one for VIP. So you basically have 1800 people in one damn line. We got in line 45 minutes after the doors opened and still had to wait almost 20 minutes to get in. Just ridiculous. I mean come on people, it's not rocket science! That can't be the full setlist...too short! And they wouldn't play PLU twice in a row. That's all he has posted so far - I'll ask for more! Advancing its commitment to connect students directly to today’s music industry, the Academy of Contemporary Music at the University of Central Oklahoma hosted Monday a private master class with Rock and Roll Hall of Fame inductee and Grammy Award-winner Elvis Costello. The class, exclusively for ACM@UCO students, took place at the Chevy Bricktown Events Center, 429 E California Ave. in downtown Oklahoma City. The students were provided with the opportunity to watch Costello’s sound check for his concert scheduled for later that evening as well as participate in a Q&A with the music legend, according to a news release. 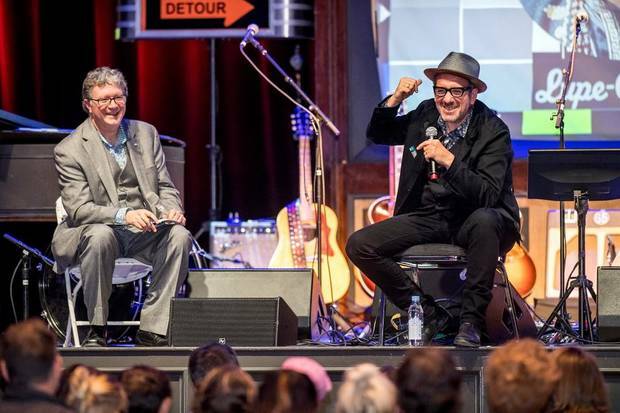 Costello discussed the evolution of his successful career in music, highlighting prominent moments from his musically-rich childhood to key turning points in the American and British music worlds overall. He stressed the importance of maintaining artistic ownership of one’s work as well as strength and integrity in today’s ever-evolving, very competitive music industry. The ACM@UCO is accredited by the National Association of Schools of Music and offers an industry-based, real-world educational experience for those interested in a career in today’s music industry. The academy offers two-year associate’s degree in music performance, music business or music production and a Bachelor of Applied Technology in Contemporary Music. Classes are taught by music industry veterans and supplemented with master classes featuring successful music industry professionals. Past master class guests include Maynard James Keenan of Tool, John Oates of Hall & Oates, Ted Dwane and Ben Lovett of Mumford and Sons, Rock and Roll Hall of Fame inductee Jackson Browne, Roger Daltrey of The Who and Jim James of My Morning Jacket. For more information about the program, visit www.acm-uco.com. What an obviously clueless grovelling sycophant that Scott Booker is... I hope his students read this. All I want is the setlist. Someone must have it! I know we’re only a few weeks away from Election Day, but can you imagine anything better than having Elvis Costello as our president? The 62-year old Englishman has already proven himself as one of the greatest singer-songwriters of our time, as evidenced by his nearly two-hour performance at the Chevy Bricktown Events Center on Monday night. So who's to say he wouldn't be just as good at running our country? Over the course of his 40-year career, Costello has established himself as the original King of Cool. His lyrical subjects are broad and his genre ever-changing, with one critic going so far as to describe him as a “pop encyclopedia.” Which makes sense for a guy who throughout his career seems to have done it all, from having his first three albums appear on Rolling Stone’s list of the 500 Greatest Albums of All Time to making a cameo appearance in Austin Powers: The Spy Who Shagged Me. It’d be hard to find an opening act who does justice to a legend like Costello, but Larkin Poe managed to impress even with that baggage. Fronted by sisters Rebecca and Megan Lovell, the Atlanta-based roots rock band ooze both pure talent and genuine artistry. With both girls decked out in black leather and ripped denim, they looked and sounded like a grittier-sounding Heart with some Janis Joplin thrown in. As a song notable for its somber, slow-burning melody, Larkin Poe’s revved-up cover had me on the edge of my seat listening to Rebecca’s whiskey-soaked vocal acrobatics. It was so good that you’d think we were in the middle of a grungy dive bar watching the sisters tear up the stage instead of an elegant theatre in downtown Oklahoma City. In between sets, Costello had a montage of still photos and music videos playing on a giant mock TV screen set at center-stage. Along with a few guitars set on display and some various signage to go with the stage design, it was a relatively stripped-down aesthetic for the solo tour. And when he finally took the stage, he was just as energetic, soulful, and wacky as the crowd always hoped he’d be. Opening with “(The Angels Wanna Wear My) Red Shoes,” Costello’s set covered his 40-year career with aplomb, touching on all of his classics while introducing some deeper cuts into the mix. I could write all day about the beautiful music he unleashed onto the crowd. I cheered when he launched into “Accidents Will Happen” and almost cried when I heard those opening chords from “Alison,” which Costello sang off-mic during a delightfully tender moment. “(What’s So Funny ‘bout) Peace, Love, & Understanding?” ended the night on a high note during his third encore, but his fiery performance of “Blame It On Cain” with the girls of Larkin Poe was also a definite standout. But while the music was obviously fantastic, the stories and wisecracks in between songs left just as big of an impression. We’ve always know how talented Costello is as a performer, but the set Monday night also displayed just how much of a knack he has for comedy and storytelling. But when you weren’t laughing, you were simply in awe of the multi-faceted artist in front of you. Hearing Costello talk so passionately about collaborating with Chet Baker and Wanda Jackson, who was in attendance, was enough to make you teary-eyed. We’re so used to placing our musical legends on a pedestal that we always forget they were just kids with nothing more than a dream and a guitar. But by combining humor and heart for an unforgettable evening, we got the chance to see Elvis Costello the person as well as the icon. by Darla Shelden on October 26, 2016 . Born Declan Patrick MacManus, Elvis Costello performed mostly solo to a nearly full house at the Chevy Bricktown Events Center in Oklahoma City on October 10. The multi-genre musical raconteur told tales during the eclectic two hour “Detour” concert. With his lovable British accent and uniquely Elvis humor, he described his boyhood history, beginnings in the music biz and recent and future musical endeavors. The stage was a show in itself, featuring a large vintage television, radio signage, a plethora of guitars, several vintage microphones, a grand piano he attributed to his well known singer/songwriter wife Diana Krall, and a chair where he serenaded us with several crowd favorites. His repertoire included materials for a forthcoming musical adaptation of “A Face in the Crowd,” which he previewed on Broadway in June. He has written 17 songs for the score, including selections he performed, A Face In The Crowd, Vitajex, Blood And Hot Sauce, and Burn The Paper Down To Ash. Stage screen visuals opened with Costello’s Monkey to Man music video, then flashed a montage of childhood photos, film noir movie posters, and other images that spun the details of his personal and musical history. First songs up were (The Angels Wanna Wear My) Red Shoes and Poison Moon, from his debut album My Aim is True, followed by Accidents Will Happen, Ascension Day, Every Day I Write The Book and Church Underground. He interspersed his multi-stylistic rocker/serious virtuoso music with relaxed, funny, and sometimes serious conversation. Costello’s father, Ross McManus was a well known singer and trumpet player in the Joe Loss Orchestra. Elvis proclaimed that he’s a sentimental type reminiscing that his parents met across the counter in a record shop. Elvis recalled working with the late Allen Toussaint, one of his heroes, on “Walking on Thin Ice” by Yoko Ono. Costello told how Toussaint rebuilt his entire career after Katrina and mentioned their collaboration on the Grammy nominated The River in Reverse. During the show he sang Ascension Day from the album of the same name. Moving to the piano he said he “borrowed from his wife,” who was “home with the kids.” The couple has twin boys. Before performing the lovelorn tune Almost Blue, he said, “I heard my wife play this song at the Royal Albert Hall before we were married and I knew I was in a lot of trouble.” Other keyboard selections included Deep Dark Truthful Mirror, and Face in the Crowd. Costello has performed numerous times at Cain’s Ballroom in Tulsa and once at the Oklahoma City Zoo Amphitheater. While on stage, he acknowledged two “friends” from Oklahoma, Rock And Roll Hall Of Fame Inductee Wanda Jackson, who was in the audience, and jazz great Chet Baker, who performed with him in London. Black and white photos of an earlier Miss Jackson and Mr. Baker were part of the nostalgic program. Moving to a comfy chair with a ukulele, ‘Walking My Baby Back Home was dedicated to Ms. Krall. While there he did bittersweet guitar renditions of Side By Side and Ghost Train. Grabbing yet another guitar, Elvis cranked up the volume on Watching the Detectives, and although solo, he rocked the room like a full band. Moving to the edge of the stage he performed Alison, unplugged. Next a delightful vintage video played of Elvis’ father (a mirror image) performing ‘If I had a Hammer’ a la Trini Lopez. Returning to the stage Costello was joined by Georgia Lovell sister duo, Larkin Poe. With Rebecca on mandolin and Megan on lap steel, they provided sweet harmonies to Costello’s delivery of Nothing Clings Like Ivy, followed by Clown Strike, Burn the Paper Down to Ash (Rebecca singing lead), and Vitajex. Using only guitars and a kick drum, Larkin Poe delivered strong blues-rock tunes with a riveting style of their own during the opening set. Glorious vocals and stellar performances were witnessed while accompanying Costello. Elvis casually stated he was unofficially announcing his candidacy to an approving round of applause, before breaking into Blood and Hot Sauce. The high-powered set finished off with That’s Not The Part Of Him You’re Leaving, Blame in on Cain. Pump It Up and I Want You. Costello, now 62, closed the show with a rousing version of (What’s So Funny ‘Bout) Peace Love and Understanding – sounding as good today as he did nearly forty years ago.